Alright, I know, the Loge has been slacking for the past summer. But for good reason, we’ve all been super busy with our respective jobs. But, I, thekiiiiid, promises that we will be back in full swing along with the regular season. It’s been a busy few weeks for all of us. So, lets get to it. Kessel goes to the Leafs for 2 first round draft picks. Yea Burke? Dude, in all honesty take him. I was blown back by this acquisition for about 2 minutes, then I thought, whatevs….Kessel didn’t buy into Julien’s system, nor will he buy into Burkes. I know, he’ll score atleast 6 goals against the B’s this year….but if I learned one thing during the first round playoff series against the Canadiens last year, f*** ’em. Tonight people were telling me, “Yo, he got a long-term contract for a lot of money.” Wow, cool, I hope his loonies and toonies keep him warm at night while the Cup is passed around the Garden or UC. Money only makes sense in the NFL or NBA, championships mean more in the NHL. What does Brian Burke, Toronto GM have to say? Well if you can decipher what he has to articulate between bourbon shots, listen here. So, what does this mean for the B’s? Nothing, Sturm is back, we picked up Begin, Krejci is will be ready in November and hopefully at that point Rask is ready to rock if Thomas is tired. For Toronto? Who cares? Komisarek will yuckie his pants like he did with the mediocre Habs, and their goalie situation is still questionable. This has little impact on the Northeast division except that Kessel has more buying power when he plays Boston or Buffalo. I’m over it. It was a difficult deal to get done, butToronto Maple Leafs GM Brian Burke stuck with it, and on Friday night he got his man. Burke continued his revamping of a franchise that hasn’t made the Stanley Cup Playoffs since the 2003-04 season, acquiring 21-year-old center Phil Kessel from theBoston Bruins in exchange for a pair of first-round draft picks and a second-rounder. The trade was contingent on Kessel signing a contract with his new team, which he did by agreeing to a deal TSN was reporting is worth $27 million over five years. 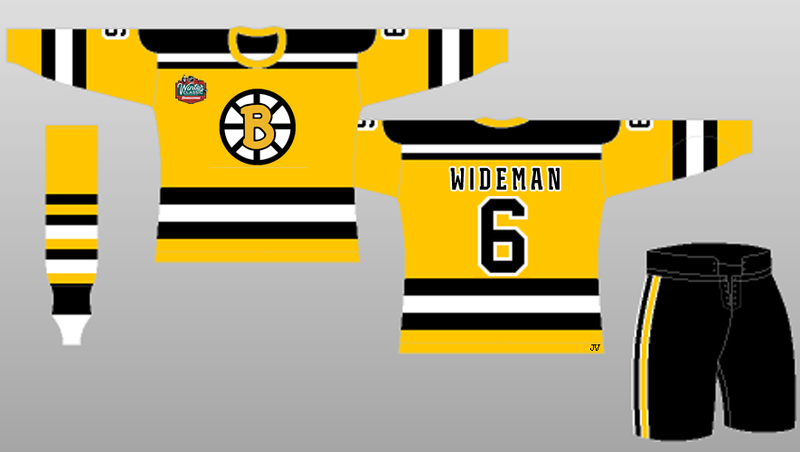 Bruins Winter Classic Jersey Leaked? BC/BU and UNH/Northeastern To Pair Off In Their Own Winter Classic? It has already been determined that the Boston Bruins will be hosting the Philadelphia Flyers in the 2010 Winter Classic, at America’s second most beloved ballpark. There was also word that Boston College would play Boston University in an encore game the following day. Now Boston.com is reporting that on August 20th the Boston Red Sox, Fenway Sports Group, and Hockey East will be hosting a press conference at Fenway. The article goes on to say a press release states that also in attendance will be head ice hockey coaches and student-athletes from BU, BC, Northeastern, and UNH. So based on what happened last time there was a press conference at Fenway with hockey teams involved, we can assume what the outcome will be. Furthermore, an inside source has told us that the BU/BC game is definitely on while the NU/UNH game is being hashed out. Pretty awesome if you ask me! To have UNH play Northeastern in the afternoon and then BU play BC in the evening would be amazing! More to come on this story. Here are a few inside pictures of the preparation for the Winter Classic announcement today at 2pm at Fenway. Courtesy of Schuyler Baehman’s Twitter pictures. Schuyler is the NHL Manager of Communications. This just in from Boston.com, the Bruins will host either the Washington Capitals or the Philadelphia Flyers on Jan. 1. Furthermore, they are also confirming that the 2010 Winter Classic will be played in Boston this year, gauranteed. Look for an official announcement from the NHL sometime in July. Yes, there will be a sheet of ice in Fenway Park for a Jan. 1 Winter Classic. It’s a done deal, Bruins vs. either the Capitals or Flyers. The league will make it official at the start of July, with a splashy media event in the old ballpark. NHL free agency begins July 1, which grabs headlines around league cities (except for Phoenix, of course) for 2-3 days. The Sox play at home July 3-12. If the league wants the day for full media attention, it likely will wait for July 13-14 to make official all details, including how to purchase tickets. Fortunately I didn’t have too much to drink at the B’s game last night because of some morning obligations (i.e. work…). However I am still hungover from that game last night! It was like a roller coaster of emotions. Goals, fights and FrenchCanadian fro-hawks EVRYWHERE. UPDATE: The Boston Globe is now confirming this story. Still waiting to hear confirmation from the NHL. Wondering if the Bruins may announce it tonight at the Habs/B’s game. ESPN.com is now also confirming the 2010 Winter Classic will be in Boston. Still waiting on the NHL. I’m sure you have noticed, but it’s been super busy outside the Loge the past 2 weeks thus the lack of conent. We apologize, and will be back in full force next week. Anyway, I came across this article on Stanley Cup of Chowder today and was super stoked. 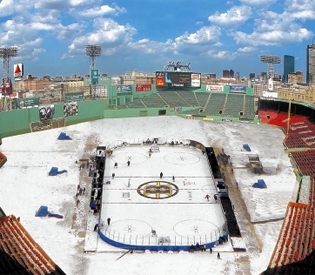 According to the Boston Herald, the Boston Bruins and Fenway Park will host the 2010 Winter Classic on New Years Day. While the opponent has not been set, I hope it’s the Canadiens, there has been rumor it will be the New York Rangers. More coverage here. Thekiid had the chance to check out Chicago host Detroit in the 2009 Winter Classic at Wrigley field, unreal experience. It’s really something the NHL has to do annually. Don’t breathe a word of this. Because nobody’s supposed to know. But the Boston Bruins will host the NHL’s Winter Classic outdoor hockey game against an unnamed opponent Jan. 1 at Fenway Park [map]!